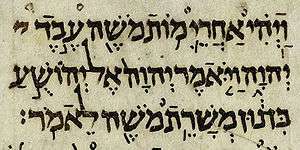 Nevi'im (/nəviˈiːm, nəˈviːɪm/; Hebrew: נְבִיאִים‎ Nəḇî'îm, lit. "spokespersons", "Prophets") is the second main division of the Hebrew Bible (the Tanakh), between the Torah (instruction) and Ketuvim (writings). It contains two sub-groups, the Former Prophets (נביאים ראשונים Nevi'im Rishonim, the narrative books of Joshua, Judges, Samuel and Kings) and the Latter Prophets (נביאים אחרונים Nevi'im Aharonim, the books of Isaiah, Jeremiah and Ezekiel and The Twelve minor prophets). Many of the writings of the Latter Prophets are thought by scholars to be older than the narratives of the Former Prophets which precede them in the canon, and were profoundly influential on the direction and development of Hebrew religion. The Latter Prophets have also had a wide influence on literature and on political and social activism in cultures outside of Judaism. The Book of Jeremiah (Yirmiyahu [ירמיהו]) can be divided into twenty-three subsections, and its contents organized into five sub-sections or 'books'. ↑ In the various Christian Bibles for Protestants, Roman Catholics and Eastern Orthodox, there are deviations and exceptions: The prophets are placed in the final section (following the writings) of the Hebrew Bible text. The major prophets (Book of Isaiah, Book of Jeremiah and Book of Ezekiel) are followed by Book of Daniel due to its prophetic nature according to common Christian theology. The Roman Catholic Bible also places additions to Daniel here, and the Eastern Orthodox Church includes additions to Daniel, plus 4 Maccabees following Malachi in its Bible canon. The ordering of the twelve minor prophets, however, which is roughly chronological, is the same for all three Christian texts. ↑ The article on "Cantillation" in the Jewish Encyclopedia shows tunes for "Prophets (other readings)" for both the Western Sephardi and the Baghdadi traditions. ↑ "Neviim". Random House Webster's Unabridged Dictionary. ↑ Coogan, Michael D (2009), A Brief Introduction to the Old Testament, Oxford University Press, pp. 8–9 . ↑ Silberman, Lou H (1991) , "The Making of the Old Testament Canon", The Interpreter’s One-Volume Commentary on the Bible, Nashville: Abingdon Press, p. 1209 . ↑ Biblica.com - Introduction to Isaiah - Scholar Notes from the Zondervan NIV Study Bible. ↑ "1. Introduction to The Study of the Book of Isaiah". Bible.org. ↑ Neeman, JL (1955), The Tunes of the Bible – Musical Principles of the Biblical Accentuation (in Hebrew), 1, Tel Aviv, pp. 136, 188–89 .